The Keystone Company of Meadville, PA is said to have made 25,000 cards per day at its peak. Their photographers documented a huge range of topics, but among the most profound and moving are the boxed sets of up to 300 images of World War I. I have a complete set of these photos. Below are some selections. French storming Hill Notre Dame de Lorette. 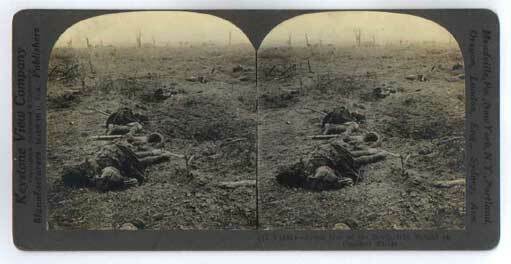 Forced to storm the hill denuded of cover by artillery, one soldier has fallen just dead, and another can be seen crumpling. 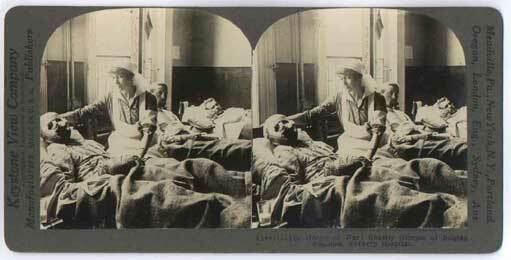 The Horror of War - Ghostly Glimpse of Wounded. Reminiscent of a scene from the Academy Award winning film "The English Patient," this Belgian is almost completely swaddled in bandages. The description on the back says "Even the nurse sitting at his bedside looks as though she were doubtful of his recovery. Her face loks worn with an over amount of work and there is a look in her eyes that makes you believe that suffereing which is on every side of her also weighs her down." Proud Men of the North Who Fought on Flanders Field. 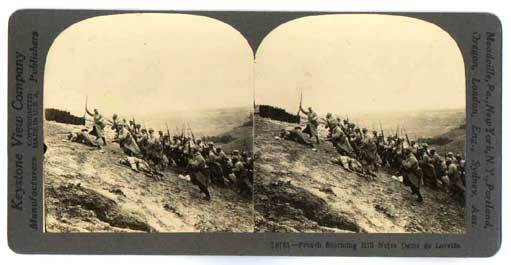 The battlefields of Belgium were among the bloodiest in history. Incredible bombardment and rifle fire left nothing standing. Here Scotch soldiers in kilts lie amid the rubble. The battle of Flanders Field was the subject of a powerful poem. The author was killed soon after he wrote it. The torch-Be yours to hold it high! All images are copyrighted and you need permission to reproduce them. Contact me for permission. If something is broken on this site, please contact me.